After leaving Bryce Canyon, we kept heading east through Capitol Reef National Park -- not as impressive as Zion or Bryce, but it too had intriguing rock faces and cliffs. We had planned on stopping at Arches National Park, but it was getting late and we didn't have time for the 60 mile detour. We stopped for the night in Grand Junction, Colorado. It turned out that their weekly farmers market / street fair was in full swing. They shut down the main downtown street and fill it with fruit and vegetable stands, knick-knack sellers and live music. By far the most dominant produce was peaches. 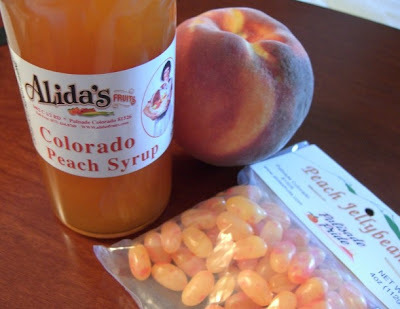 It turns out that Grand Junction lives and breathes peaches when they are in season. We stopped in a little peach-centric store and picked up the goodies pictured above. The jellybeans are made with real fruit, and taste completely different than typical candies. We had dinner at Rockslide Brewery. The food was decent pub fare, but the beer was pretty average (at least by San Diego standards). One thing I learned in Grand Junction was to never ask for whole wheat pancakes at a local diner. You'll get a blank stare until they realize you're from California and they then write you off as a health nut. You're better off getting the chicken fried steak or bisuits and gravy.